Chiharu: This guy is your father? The guy who left you with that 150 million yen debt? Chiharu: Complimenting this apartment and being kind to Nagi!? Shun: That was a lie, of course. Shun: Hayate, I heard you were having fun with your rich ojou-sama. SHun: From observing you, I was able to collect some interesting info. Hayate: What failure!? Look how much I've gone through because of you and mother! Hayate: Come to think of it.. where's mother? Dad: ;) You're as dull as ever, aren't you? Hayate: The hospital! Ojou-sama is in danger! HAYATE'S EVIL MOM as Kanzaki: Thanks for seeing me today as well. I'm on your side. Nagi: Why do they all go away? Why does everyone close to me go away? Kanzaki? : Isn't that because... no one loves you? Kanzaki?" For example, that guy you always talk about... your butler, Hayate? Kanzaki? : Was that really a love confession? Kanzaki? : Ah, Hayate-kun, it's been a while. Hayate: As expected...!! what are you...! Kanzaki? : Why? You're the same, aren't you? Kanzaki? : But you really intended to kidnap her. Even using the sweetheart angle. Hayate: That's wrong! I wasn't! I wasn't fooling her!! Kanzaki? : But you know it was a misunderstanding don't you? Hayate: I do know but...!! Hayate: It's definitely a misunderstanding but... I never intended to fool her!! Is it strange that I don't hate Hayate's mom and actually agree with her here? 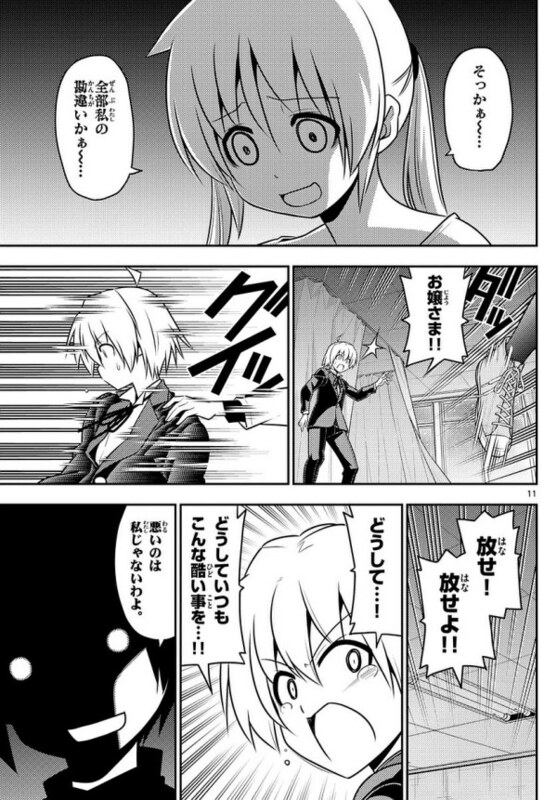 Hayate's mom grabs him and prevents him from chasing Nagi. Hayate: Let me go! Let me go! Hayate: Why? Why do you always do such cruel things...!! Kanzaki? : The fault isn't mine, is it? Kanzaki? : This is all your fault. Repent for your sin. 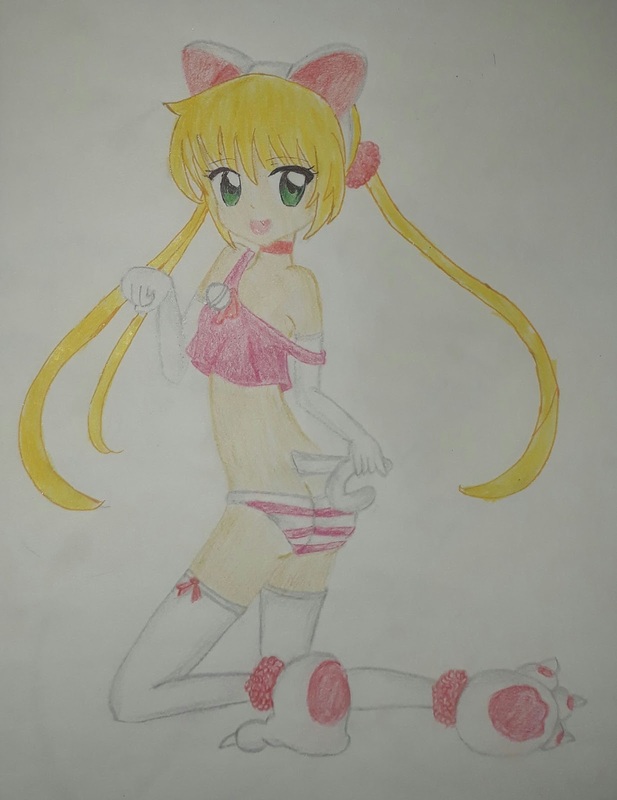 Nagi: Maria! Maria! Help me! Nagi: Maria... why aren't you here? Nagi: Hayate, you liar! What do you mean you're going to protect your ojou-sama!! Nagi: I wish you were gone! I wish it was Maria here right now! Hayate: That's wrong! That's wrong! Nagi: So... does that mean you love me...! Nagi! Nagi! 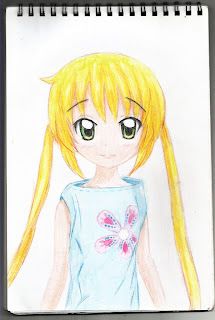 Mai little Nagi! Don't cry, my baby! Nagi: IT WAS ALL A LIE! Text: Hayate's thoughts and Nagi's wish for all the lies. And then---!! Review: I have two extreme reactions to this chapter. On one hand, seeing Nagi so miserable here... MAI POOR LITTLE BABY! WHY HATA! WHY MUST YOU PUT HER THROUGH THIS! Nagi just needs a hug right now. 1. Hayate said so much more when he revealed the whole misunderstanding to Nagi. It really has a lot more impact with the full thing said. Also, his mother is really, really evil. She even prevented him from chasing after Nagi immediately. 2. Nagi also said a whole lot more than I expected. 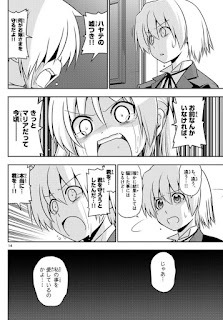 Her saying that she wanted Maria to be with her and not liar Ayasaki is really what triggered Hayate's not so manly tears. 3. Hayate was trying to say something while explaining why he wanted to protect Nagi. He kinda stopped when Nagi asked him if he loved her... but what was he trying to say there exactly... :)? Well, I dunno when the next chapter comes out now... coz it wasn't shown. Hopefully, it's next week coz things are getting so exciting. I've been trying to disprove the Kanzaki = Yukariko theory for a while. I guess some people see this as the last stand for a non Hayate x Nagi pairing at the end so we can go with a happy family end instead. Well, that ain't happening now. Kanzaki wasn't who she said she was all right! 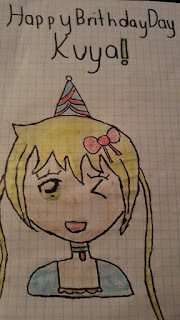 Fanart Corner: It was my birthday on the 20th and... 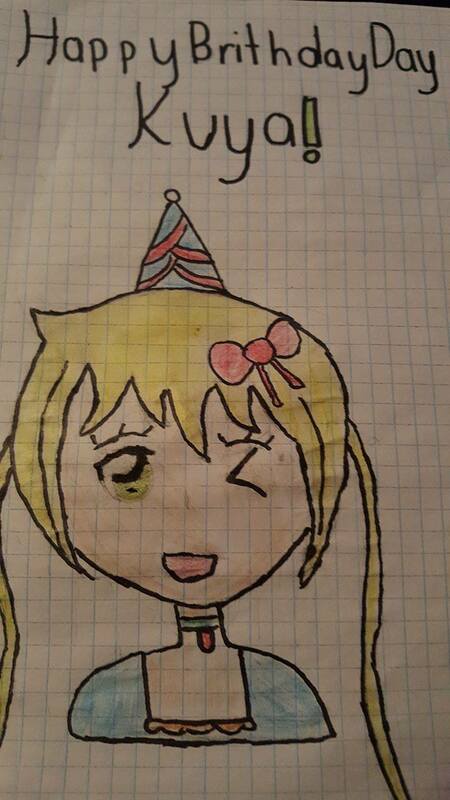 I even got a belated greeting from Hata~ (I let him know it was my birthday via a Nagi doll pic tweet). Anyway, featuring some fanart that some online friends drew for me here. 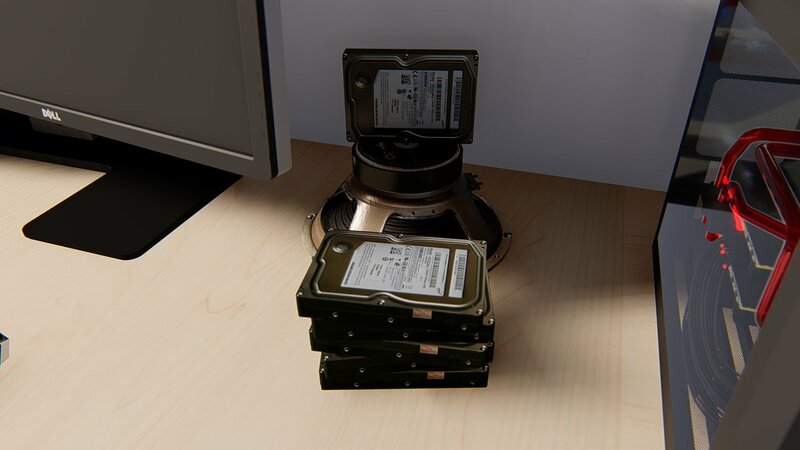 The last one is mine. 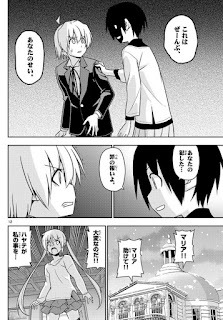 Hayate: In the end... these hands couldn't protect anyone... not even the most important person... not even..
Hina: What do you think you're doing! Hayate; But I can't... she knows... about the misunderstanding... she hates me now. Athena: You really are dense, aren't you? Ayumu: She's in pain right now... she's suffering, but she would never hate you... and even if it looks like she does... I know that she really doesn't! Ayumu: Just because she hates you doesn't mean she does! Hinagiku: That's right! You heard me! I'm in love with you and I still am! But... when I looked into your eyes. I knew dammit! I knew that you only had eyes for her! That's why... that's why... don't say such cruel things like "you never loved her." Athena: We loved each other once... so I know this is true as well. Mikado: Didn't I tell you once? Use that stone, Hayate Ayasaki. Use it to prove to me that it's the stubborn, hard workers who win out in the end. Your fanfiction was absolutely brilliant. Loved it! Just one little thing. In your translation, you typed, "hayate: I wish you were gone..." instead of Nagi: I wish you were gone. Also, I missed one line from hayate there. Corrected it now. I was just so excited! One big problem I see with Hayate on Nagi throughout these two latest chapters is that he did not address her feeling of loss at all. Maybe he couldn't, or maybe he wasn't wise enough himself to offer any comfort, but a loud banging party is a bad idea anyway. So, what would Hayate's parents be in this final confrontation? Are they the mooks or are they the last boss? True, there was actually more reason within the framework of the story for Kanzaki = Yukariko rather than me picking out MRC/Redev Guy = Shun Ayasaki... but as I've noticed, this manga doesn't always go by logical reason but rather, by the flow of the plot. In that sense, Hata has always been more of a plot-centric writer rather than character centric IMO. Yes, he never did try to address her feelings of loss... nor her feelings in general. His idea was to cheer her up like a little kid with a party thinking that hopefully, that might lift her spirits. His heart was in the right place, his head... well, he always a broken individual from the start wasn't he? IMO, Hayate's parents are the true last bosses here. They could be under employ from Hisui, but as it stands right now, they're much worse than Hisui who is just blatantly greedy and violent. Hayate's parents are villainous on a much deeper level playing with both their son's feelings and mai waifu's feelings like that... with that said, I enjoyed seeing Hayate suffering :). Hayate's parents might just want the Royal Power for themselves, and they might even one-up on Hisui in that, while Hisui didn't seem to have an idea what she would wish for with the Royal Power (she just wanted it for no reason), Hayate's parents might actually have something in mind. Hence in terms of motivation, Hayate's parents might be stronger. In fact, out of the bad guys, Hisui might have the weakest motivation for the Royal Power. Quite true. Hisui is dangerous just because she's plain crazy. Meanwhile, Hayate's parents are infinitely more malicious with specific intent behind all their actions. Even the act they put on together as Kanzaki and as that real estate salesman was so perfect that nobody (at least in the manga universe) suspected a thing. 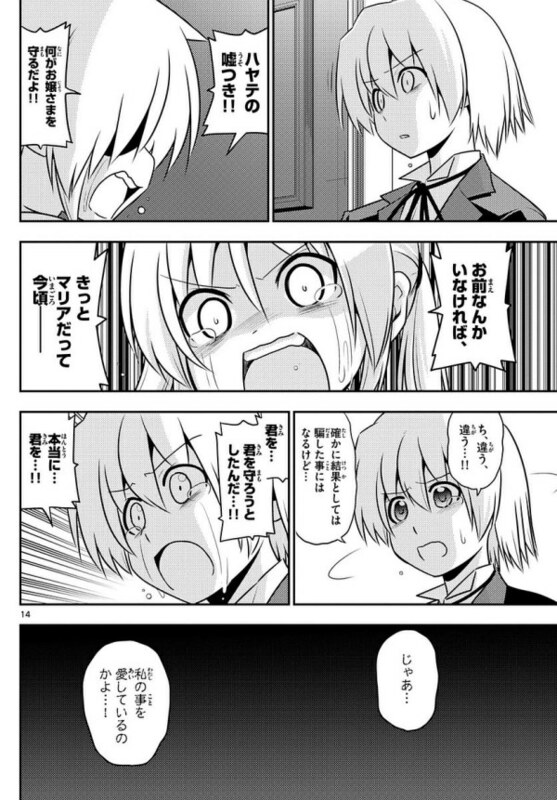 Also, it seems Hayate's mother derived some kind of sick pleasure in the psychological torture she was inflicting... all while looking completely innocent and airheaded just a few moments before. Just happened to notice that Kanzaki and Hayate's mum had totally different eyes/irises. You know, if Hayate's mum is this good at impersonating that she could even change her eyes, then guys like me are just going to be fooled. Good point. She also somehow even knows about Yukariko's ditzy ways. I suspected that she wasn't Nagi's mother but it wasn't until I saw the early spoiler pages that I even considered that she was actually Hayate's mother. It does make sense though -- the way she wasn't around when Hayate tried to come over for a visit and all. Haro, someone linked you to me for latest chapter as well as its summary so yeah, thank you. Unfortunately, I am not, sorry. Were you thinking of mysticswordsman21 instead? Ooooh! and yes I was. Sorry, my mistake. Somehow, I conflated your nicknames in my head. :). Pretty sure I've seen you around in some older Hayate forums though. I never post nor register, but I always lurk where people are talking about mai waifu. Yeah, me & Aden went way back when the series was at its height (pre Greece) so people sometimes mixed us up due to both of us being dedicated to Nagi. Also yeah, real life catches up with all of us at times. With that said, Nagi is literally my life nowadays. Fictional character, unhealthy obsession or whatever, but I really do like her that much -- especially now that the manga has come this far. I'm kinda sad that the series is taking so much flack from the English-speaking community nowadays. I'm glad that there are still people like doughnut gunso/hayatereport who just left a few comments up there who can write good, detailed reviews without being extremely vindictive and dismissive towards the manga or my ship. Really, Hata has been rushing it recently. Everyone knows that, but there are still some redeeming factors left in it even if you're not a Nagi shipper. I'm pretty sure that Hata is not that awful of a writer that hate is all there is left for his manga every time some parts of the fandom talk about it. Thank you mate, you are awesome too for being dedicated to her all this time. I know how you feel in your obsession. I mean, 9 years had passed since I first fallen for her and well, I'm still using this username. Her character development just improved her appeal so much that its heart-breaking anticipating and seeing the despair. The English community had kinda forsaken the manga especially after the Greece arc since that was the height of series for most of them. Its also helpful that there are people like you & gunsou who cover the chapters to let the remaining few knows of what's to come. Yeah, for all its flaws, I'd take this arc over the timeline inconsistencies of Can't Take My Eyes Off You any day. Also, at least now the misunderstanding is being properly addressed. There's no way that Hayate can be ambiguous about his feelings now if he expects to rush into the royal garden after Nagi is trapped inside. CTMEOY was ok for me. Nagi was portrayed very well. I think for anime-only watchers that was their first glimpse of how different manga Nagi had become since S1 and S2. Not sure exactly what kind of ending Hata will go for and if it's going to be similar to Toradora, but I think it's certainty at this point that they will end up together. Hata has carefully torpedoed the remaining ships and removed all obstacles so far towards this end after all. 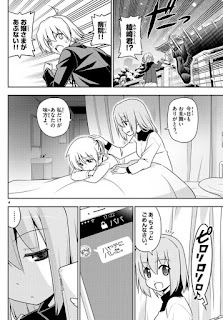 Even the debt has been cleared (which was Hayate's main excuse for staying with her) and now the misunderstanding has been fully disclosed -- which Hayate hadn't been doing anything about ever since her learned about Nagi's true feelings. Also, the happy family/reunification with Yukariko and Hayate with his parents possibility has been ruled out. Having been shown that they have different parents, the "sibling theory" has finally been put to rest. Unless Hata goes with a bad end, the Nagi route is the one true route. That, and fish for spoilers from various web sources this weekend LOL! That's about the time when the early spoiler pages are somehow released in Chinese forums... seriously, I have no idea how these guys get a hold of the pages before they're actually released every Wednesday in Japan. Here's a crack theory from a friend of mine: What if Hayate's parents have actually reformed? Everything so far is an act orchestrated by Maria in order to test Hayate's feelings for Nagi one last time. "My image of Hayate's parents from the early days of the manga turned completely upside down! Absolutely stunning development! I'm eagerly anticipating the next chapter"
"I'm crying! But it's ok, I'll believe in Nagi chan's feelings of love. I'll believe in a HAPPY END"
but it's in japanese, it counts! "Nagi... Nagi... I'll eagerly await to see Nagi's smiling face again." "This week's Hayate was amazing! Particularly that time when you showed their faces. It gave me goosebumps. My hairs were literally standing on end." "This was extremely painful. Poor Nagi was crying. Really, I can't tell how this will be resolved from this point on." "Everything ties back to the beginning of this manga, I think." "The power of despair is dreadful. Hayate's parents are so evil." "little by little, the time is really approaching. I wonder what kind of ending we're getting. I'm eagerly anticipating." "That was really harsh. I'm eagerly anticipating the final confrontation." "My belief is that even with that crying little girl, the world can't be saved. It's going to take the power of the goddess A-tan to heal everything." "Everyone will get their happy end. It's going to tie in to that scene at the start of this final chapter." "I was just casually reading this story. So much damage... how could this have happened?" "Every week I read this. The climax is approaching. I'm looking forward to it with endless excitement. I've been with this series since the start of serialization." "This development is a lie, I think... 😢"
"Nagi-chan's so pitiful!... I'm going to read Skip Beat to recover." "I believe that Hayate's parents are... UNFORFGIVABLE!" "To think this could happen from reading Shounen Sunday..."
Oh my god. This is so good. I love these guys. Specially the one who's reading skip beat to recover. Because I'm doing the same. But it's so good to know that many people are actually excited about the ending of the manga instead of thinking that the ending would be dull. I myself was pessimistic for a few days. Until I saw this chapter. It rebuilt my hopes. It all goes back to Nagi's manuscript too. It said something about having gone through many trials, their bond was put to the test at the end of the story. Now that trial has come to pass. I'm really excited to see how they each come to terms with what they really mean to each other. I'll believe in Nagi's love because I'm pretty sure that even though she's probably feeling the lowest she's ever felt in her life right now with Maria leaving her and now learning about the misunderstanding, her pure and honest feelings of love for Hayate will win out. As for Hayate... well, he'd better prove himself too. Those tears are at least a telltale sign of how much Nagi means to him -- now he just has to give it just enough thought and reflection to substantiate the confused feelings he has for Nagi right now. I wonder if hayate has thought of nagi romantically in his unconsious mind. When they went to visit the rainbow village,hayate thought nagi will eventually have a boyfriend. Then there was a place where she was shown to have 2D relationships and the face in the tv looked so similar to hayate's. Even in her dream, he actually kissed him to wake her up properly. He even did not know about her feelings but felt that she would be happy if he kisses her. If he really thought of atan alone, why he said he 'loved' her while he told hina that he 'loves' her just few days ago? Moreover, when nagi destroyed the stone, he was not shown to be assured as then he could go to save his love. But he realised nagi to be the most important person in his life and even saw the future! If everything is only for gratitude , then how can he act so naturally in front of her. We normally have a bit of awe when we meet our savior. And hayate was overprotecting her at the first when he served food to the guests which were made by him to cover the bad cooking of nagi. But he let her bear the result of loosing to ruka and was not strongly supporting her when she was in such a disaster in mangaka arc. Can the intense sense of gratitude and obedience allow him to do that! Or there already is another hidden cause, huh? I think that in order to justify a Hayate x Nagi ending, Hata does need to go back to those scenes that you have mentioned and others (especially that kiss scene in Hayate's head). What I'm thinking is that he needs to show that Hayate has indeed considered Nagi as a romantic partner before but he has been consciously trying to deny it maybe because he still thinks she's too young and he just wanted to keep the status quo even though he already knew that she was maturing. That he wants to keep the status quo is pretty obvious since he denied Nagi's maturity when Maria brought it up. 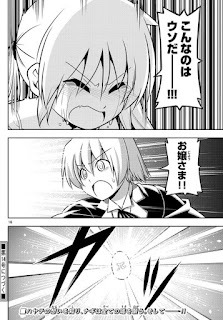 Ya know, looking at this chapter and seeing Nagi reject Hayate and actually hate him for a few brief moments feels really refreshing when certain factions in the fandom have been clamoring for Hayate to reject Nagi for the longest time. Greetings! Pleased to meet you and welcome aboard. Glad to know you're on Nagi's team. Nice to know another viewpoint of Nagi. I told Hata on twitter at one point that Nagi's life story is my inspiration for living -- I really meant that as well. She's a really amazing protagonist who deals extremely well with the cards that life has dealt her with. 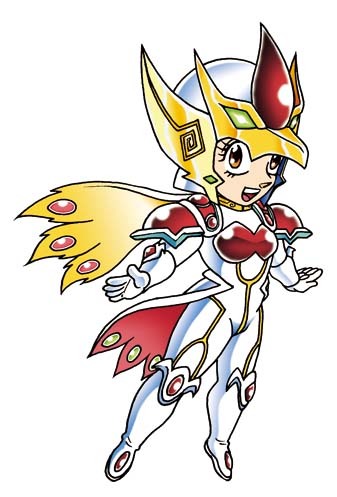 She wasn't always as amazing as she is nowadays, but you can always notice back before her pre-character development days that she had this desire to improve and it's not that kind of "I will work hard therefore I will win" kind of philosophy that I find really stale. Nagi isn't a hard worker. She's lazy but she gets the job done. She doesn't get motivated until she's pushed to the walls -- even then, she usually doesn't have the abilities to overcome the initial trials she's put up against. She gives up easily. She gets depressed. She cries her heart out. She thinks about quitting and just giving up on everything -- but then somehow, she doesn't. She finds something to cling onto and makes an epic comeback -- but not an impossible type of comeback beyond her abilities. Again, she works with the cards that she's dealt with and somehow finds a way to win -- or at least find some measure of victory -- and whatever the results, she comes out a better person because of it. She is a very different person from the way she was in the initial stages of this manga, but on the outside, she still sort of acts the same way. Still the same lazy otaku brat from before -- but somehow, a little bit better, a little bit stronger, a little bit kinder, and even more in love with her co-main character than before... and it's just beautiful to watch her live her life like this. I'm rambling a lot, but this girl really inspires me... and I've read my fair share of stories in my time from visual novels to light novels to anime/manga to movies and pieces of classic literature, but Nagi is the only character to ever move me like she has. At the end of the day, it all comes down to personal preferences, but this why I know for sure that I do love her with all my being -- as obsessed and deluded as that might sound for others. I watched the anime in 13. 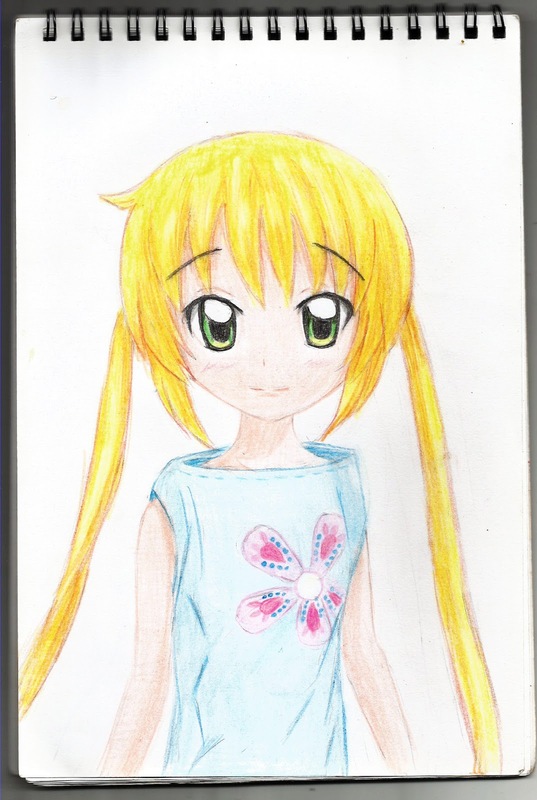 I was then in nagi's age and found some resemblance between us. Those were passion for hobbbies, lack of physical strength, not being social, wanting to do something big and then understand our current inability, desire to have attention of others, try to ignore study, short temperedness and dreams. But her innate ability to understand others and deep care always amazed me. And as the story went on, her growth was beyond my imagination. Her wit and hard working are just awesome. She often knew very little about the situation but her tiny contributions made huge impacts. Kyoto-ise is my favourite arc, I never thought she would go that far to follow her dreams! @violent cloud, your short character analysis was just wow... I think I am starting to like her even more now. I myself relate with both main characters. I'm a lot like Nagi in the way I deal with life, but a lot like Hayate when it comes to luck. Great observation about Nagi's contributions making huge impacts. It's even more amazing because no one really tells her what's going on most of the time. Like when she broke the stone for Hayate's sake. im on nagi's team, when i read chapter 561 it really break my heart when see Nagi broke down and crying like that, but to be honest i've been waiting the situation where nagi and hayate got into fight about the misunderstanding for a long time (minus the royal garden because i didnt expect that going to be involved) but finally it come true and i cant wait how they both solve they're misunderstanding..., i watch the anime when im in grade 5 and now i already 3rd year in high school, time sure does fly.. I agree. I think most of us on Nagi's side and even people from other ships or just here for the story would agree that the misunderstanding bomb needed to go off. It had to happen so that the fundamental flaw in their relationship can finally be addressed. It's hard seeing Nagi the way she is now, but all we can do is believe and hope for happy ending. Unfortunately, I think Nagi's team will always be in the minority... but that somehow also makes her more special, I guess. I see. Well, as you can see, I've just posted the latest chapter. Here's an amusing story about Nagi finding a cat by the roadside. Nagi: Oi, the volume of traffic is low but you're still going to get run over if you stay there. Nagi: Oi, this pattern, could it be? Nagi: Can't be helped. For now, I'll pick you up. Now, who should I turn you over to. Ayumu: Turn it over? But the law requires that it's at least 3 months old before you can turn it in. Ayumu: It can't be helped, you'll have to take care of it for 3 months. Nagi shown taking care of the cat. Nagi: Eh... such a bother, such a bother. Nagi: are you for real? Hiyori is family!! Hmm... no spoiler pages so far. Send me a link if you find any... on that note, I didn't see the announcement for the next chapter last time. 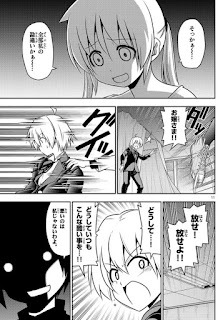 Seeing the english translations, I am confused about what happened at the last panel... Did nagi wish something by the cost of 50 years or just she opened the path by explosion of negetive emitions. I'm not sure myself, but I'm leaning towards Nagi opening the path as that would make a lot more sense. Also, I have to disagree with them translating "uso da" うそだ into "this can't be true." I realize they go for context most times, but this is one time that the context feels off. Haters will rejoice for a while after reading this chapter (in English) for the first time... but honestly, we Nagi fans have been waiting for this to happen for ages so that the rest of the fandom can finally stop b|tching about the misunderstanding already. Now it's come to light on the best terms. It came just after every other possible ship had been sunk and after Hayate was coerced into stupidly revealing it by his evil parents. I think the timing of the bomb going off is really good. It'll only be the two of them now, no other girl (or boy, for that matter) will be more significant than the two of them. It was bound to happen, it was destiny for them to meet and it was destiny for the bomb to go off. And I think it's destiny that they will end up together. Yup, it may have been a rocky path getting to this point, but now we're heading towards the ending I've always wished for. I've said this before, but the King's Jewels Plot, the Royal Garden, the pseudo love triangles and everything in-between were really just obstacles placed in-between. The story was and always will be between Hayate and Nagi -- and I'm glad the recent chapters are proving us right after years of putting up with haters and naysayers ridiculing our ship and dismissing our theories. Found the spoilers for 562. Chinese scans are really fast... anywayz, looks like Nagi made a wish for Hayate to love her or something like that. Nagi's wish was for "a world where Hayate loves me." Do you think Hayate will end up forgiving his parents due to different values in japan? He may think that if his parents didn't sell him, he would not have met with the most precious person in his life. I think he should forgive them and move on. But I wonder if the parents will face any comeuppance? Like from the Yakuza or something. I hope after he forgives them... The Yakuza end up getting Hayate's wretched parents. For what they made Hayate go through, his parents don't deserve to live. Hayate should forgive them but for his sake. I think his parents are really broken individuals from the start. I don't know what led them to become the way they are, but I'd agree that they're harmful no matter what.